From this article I hope you take away these two things. First: Learn how God is using Japanese Ministries in Seattle, so that you can support it in prayer and offerings. Second: Recognize the opportunities all around you in your daily life where God wants to use you to increase his kingdom with your God-given personality, skills and experiences. Think of an hour-glass shape. That’s a good picture of how Japanese Ministries works. The wide open top of the hour glass is where we look for the needs of the larger group of Japanese people around us, and how we can meet that need. It might be for English conversation, cooking classes, parenting classes, food and fun activities that help them to acclimate to life in Seattle, etc. We take advantage of opportunities to be welcomed onto the local college campus where we can invite the entire Japanese student group, an average of about fifty students yearly. 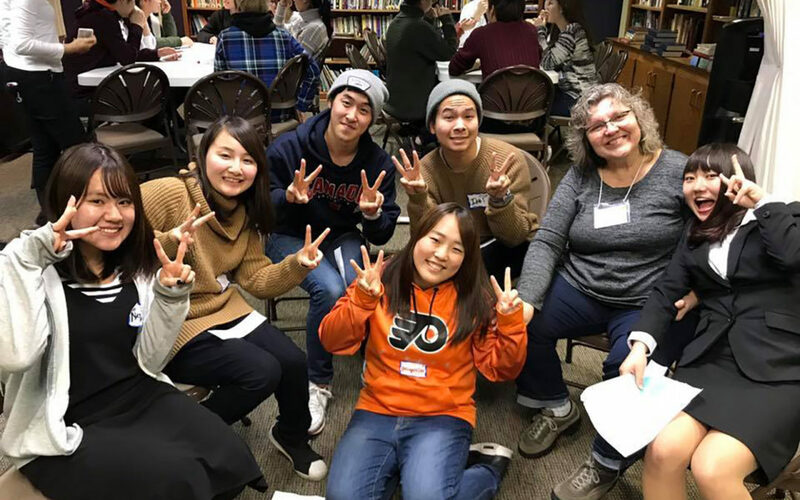 We network with other groups and churches in the city who are also reaching out to the Japanese community, relying heavily on our faithful team of volunteers, most of whom are from Rock of Ages LBC. We hold large events every other Thursday for students, as well as Tuesdays for the women and children. There, we always take the opportunity to invite them to Sunday morning worship in Japanese at church, and to bilingual Bible Studies and BBQ’s at our home. A student-hosted Saturday evening event called “JxJ” (Japanese for Jesus) is where they hear Japanese Christians’ testimonies, sing songs, play games and of course there’s more FOOD! It’s all about giving them every opportunity to meet their needs, meet Christians, hear the Word and have a very good time doing it. This is where the hour glass narrows. Out of the larger number, maybe ten to fifteen people start to show interest in coming to church and to our home regularly for Bible Studies. Almost every year several accept Jesus. Then they are discipled, and finally introduced to a church in Japan. This is where the hour glass widens out again as they return to Japan now as believers—who otherwise might never have heard the gospel—to influence their world for Christ. So, has your mind wandered a bit toward who might already be in your everyday circle of influence? Or, maybe how you might have to step out of your circle a bit and into someone else’s? Stop and look around you. Put your phone in your pocket or purse and engage with the person standing next to you. One of the Japanese students told me that this is what they like about America: people talk to them, and ask how they are, and seem to really mean it! That’s so contrary to what they experience in Japan. Will you be one of those people? It could change a life for eternity. Sue Olson is a member of Rock of Ages Lutheran Brethren Church in Seattle, Washington.